Setting: Providing rapid reps at varying intervals, the Attack will meet the requirements of all setting drills. Accurate and consistent soft sets with no spin are provided at any angle and height. 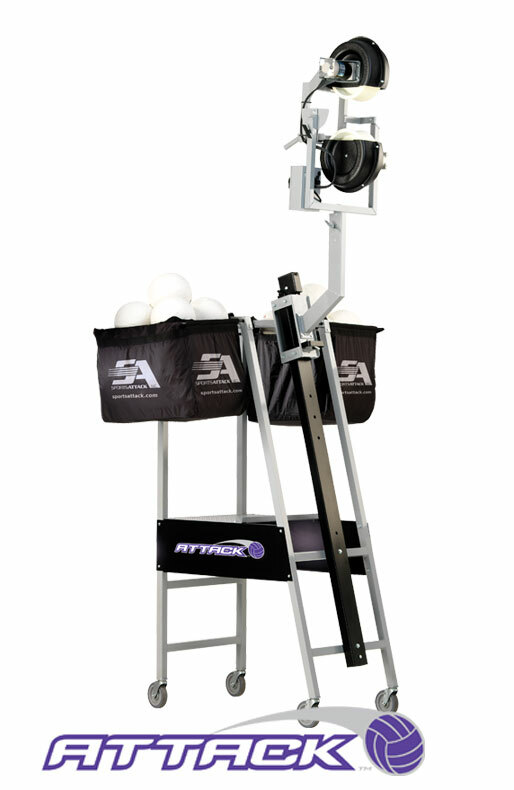 This machine can be set to release the ball from a realistic setting height, not from floor level like some competitive units. The locating pins on the shaft will allow you to instantly position the throwing head down to the setting position. Ball wear is extremely limited due to the two 4″ wide, soft white polyurethane ball gripping surfaces and the contoured shape of the ball throwing wheels that uniformly distribute the contact forces, eliminating the high wear contact points. The Attack can be safely operated by any assistant coach, player, student or parent. This frees the coach to be by the receiving players to teach proper mechanics effectively. No more yelling across the court. It also allows the coach to improve the quality of standard drills and to create new machine drills for every phase of the game. The Attack platform has a 16-gauge diamond plate, non-slip surface for sure-footing and safety during use. and Tempo Coach can control tempo by feeding continuously or delays. No recovery time is ever needed. The speed, angle and spin are instantly controlled by the coach with each serve, set or spike. Air-propelled machine can be set to toss up to 1100 balls per hour (one ball every 3.28 seconds). However, recovery time is necessary after rapid fire of 8 –10 balls. and Wear New design includes specialized throwing wheels that are shaped to grip the ball with even pressure across a wide 4″ span to increase velocity and minimize ball wear. No specific ball required.